ConfigMgr offers limited support to manage an OSX-device, however you can extend the capabilities using third-party tooling such as Parallels Mac Management for SCCM. Parallels Mac Management for SCCM primarily offers something similar to Software Center – namely an interface called Parallels Application Portal that will allow available applications (not the classic package) to be installed or removed through a user interface. 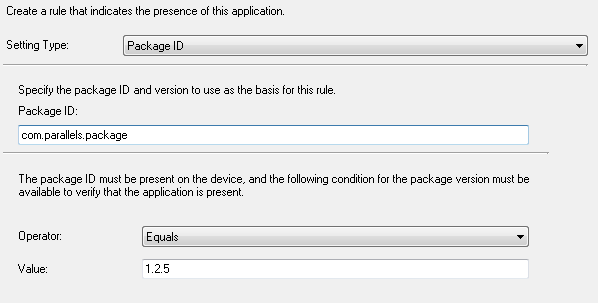 Unlike the Windows-applications and their respective deployment types for an application the ability to configure the deployment is rather peculiar. You will need access to an instance of OSX where you can generate the package. As previously described on howto deploy Symantec Endpoint Protection there is a small tool to generate a ConfigMgr compatible package from various different formats available for OSX to install applications. Once the package is generated it will contain the binary pieces of the application, aswell as a basic command-line to install the application and (optional, but enabled by default) a detection method to verify that the application is installed. As Parallels Mac Management for SCCM has the ability to also uninstall applications there is a need to specify the command-line for actually removing the application. Using the “:” you can provide the two commands on the same command-line. 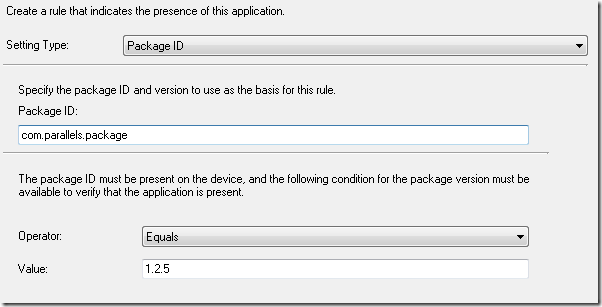 Detection Method will be determined by default (you will need to specify the –c option to avoid having it generated within the ConfigMgr package) when a package is created. The Package ID can be reviewed within OSX using the pkgutil. Using && (and) we can combine our multiple commands for uninstall – both removing the Parallels Desktop.app and the package information. Unlike the Windows-applications where the install / uninstall scenario are split into two separate command-lines there is a single-command line to handle for OSX. One needs to be familiar with OSX tools to manage applications and the terminal capabilities to successfully manage a successful installation and uninstall of an application. Small typo I guess. It is -s to create package without detection method.